The University of Hawaiʻi at Hilo is a growing university of 4,000 students that offers a wide range of liberal arts and professional programs, as well as a number of graduate and doctoral programs. We are looking to the future and preparing our students to make lifelong contributions to their communities and help build a prosperous future. UH Hilo offers an exceptional campus and island setting in which to live and study. The university community enjoys a rich diverse student population, with a unique blend of local, mainland and international students, all living and learning together in a harmonious and safe environment. The surrounding island community, rooted in an agriculture history, is one of the most ethnically diverse in the country. The island landscape, too, is extraordinarily diverse, with snow-capped mountains, windy deserts, lush rainforests, endangered coral reefs, protective estuaries, active volcanoes and more. Most importantly, we live in the home of our indigenous host culture, and everything we do supports the infusion of Hawaiian values of cultural knowledge and language. Our nursing, teaching and computer science, pharmaceutical sciences and other key programs are strong and growing. Our interdisciplinary STEM programs—astronomy, math, chemistry, biology, marine science and more—make our graduates much more flexible in taking advantage of limited opportunities. Our humanities disciplines are in sync with our local community’s need for professionals in culture and the arts, language and communications. Our agricultural programs are addressing the pressing need for our state to move toward sustainable food systems. Our business and economics program offers one of only two AACSB-accredited business administration degree programs in the state of Hawaiʻi. Further, our students get a big boost with applied learning experiences in internships, collaborative research with their professors, and community outreach. These are the kinds of practical experiences that make our graduates a cut above in a tight job market. When our students graduate, they have a diploma and a resume. On behalf of the UH Hilo ʻohana (family), I’m very pleased to welcome you to the UH Hilo campus community and wish you every success in your educational endeavors. 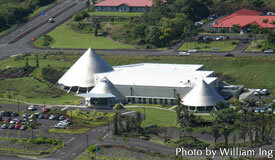 The ʻImiloa Astronomy Center is where astronomy meets Hawaiian Culture. Last updated on Tuesday, August 14, 2018, 2:04pm HST.